Powersolve offers two USB charging hubs intended to charge and sync up to 20 USB devices at the same time. This includes iPhones, iPads, tablet PCs, smartphones or any USB compliant device. iOS and Android devices are both supported. The PSUSB-1024 will charge and sync up to ten USB devices simultaneously whilst the PSUSB-2024 can manage up to 20. According to the company, these are excellent tools to efficiently perform CDP/DCP mode switching and are ideal as medium capacity in-house stations for charging and syncing multiple USB devices. 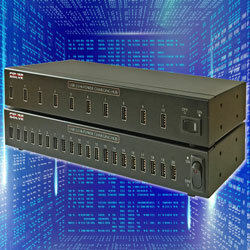 Both hubs can be cascaded with another unit of the same type to double the number of ports. The hubs are compliant with USB battery charging specification 1.2 and provide up to 1.5A (CDP mode) or 2.4A (DCP mode) output current on each port. They support high-speed 480Mbps, full speed 12Mbps and low speed 1.5Mbps operation. The hubs are presented in a compact aluminium housing measuring just 268mm x 102mm x 40mm and powered by an external universal AC input power supply with full safety approvals and is supplied with the hub unit.